His and her shower heads are a very popular way to update your master bath shower. They allow for couples to shower together without one person standing under the hot water while the other is freezing. By following this guide, you can learn how to add a second shower head to make mornings better for both of you. ​Do You Want to Control Your Own Temperature? ​What Type of Dual Shower Head? ​There are a few questions you should ask yourself and your partner before you take on this ​intermediate DIY task​​​. That way you know what options you have and how simple or tough this task can be. ​If you're having some trouble deciding, here's something to consider: some shower head and panel units can actually be controlled​ by compatible home security systems you may already have at home! You just have to find one that works well with what you have at home! 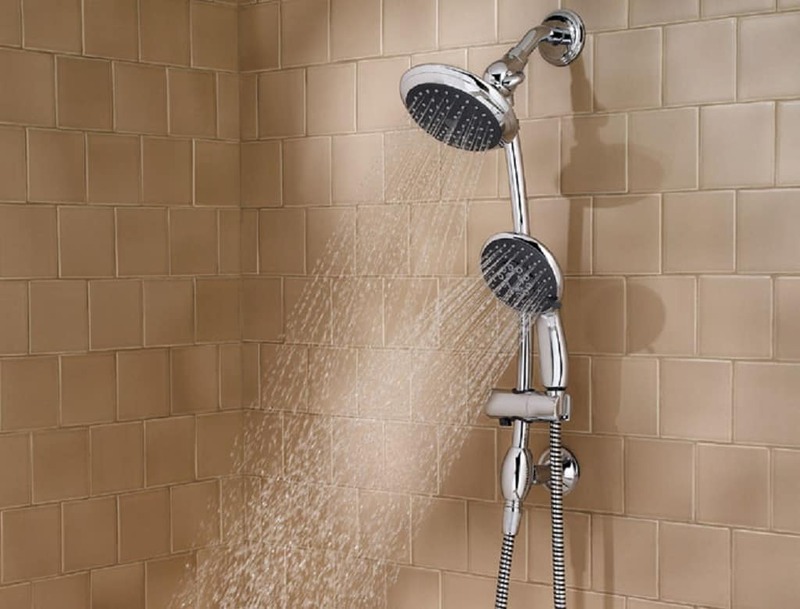 ​You can have both shower heads tuned to the same valves. This means you set one temperature you both agree on. The water will also be split between the two shower heads. You may need to look into some options below regarding water pressure. If you can agree on the same temperature in the mornings, a single shower valve would be okay for both. If you're in the market for a new showerhead, we've put together a review of the best ​dual shower heads on the market. Another option is to install a separate shower valve for the second shower head, such as adding shower panel. With a second shower valve you will be able to control each shower head’s temperature to fit the heat preference of whoever is using it. Having control over your own shower head allows you to have it warmer or cooler than your partner prefers. The downside to this option is that unless you know a good amount about installing plumbing lines, you will want to hire a professional. To stay on the easier side of the DIY road, opt for the dual shower head. This way you can update your shower without having to hire a professional to cut through your tile to add in a second water line valve, additional pipes, and a new shower head hookup. ​Are you looking for two shower heads that come out from opposite walls? Would you like to have an overhead rainfall shower head with a moveable handheld that is on a wall close by? A good example of this would be the ​Pulse Kauai II Shower System. You could also have two shower heads that are connected to each other, limiting if you want one on at a time or have both going at once. These dual shower heads can be a shower head and movable wand or two separate shower heads that pivot and turn. There are many different options you can chose from depending on what will fit you and your partner best. Take the time to see which shower heads will maximize your morning or evening routine and help keep the shower a relaxing place. One issue to pay attention to is your water pipe thickness. This regulates how much water can come through the pipe per minute. If you are not on city water, you could be encountering the issue of your well not being large enough to accommodate multiple shower heads at once. If this is the case, you will want to look into upgrading your well pump to keep the water pressure at its normal state. You could also opt to add a water storage tank. This could hold an additional amount of water to help keep the water pressure steady as you demand more of a flow. If you don’t want to focus on the water pressure, you can opt to use low water pressure shower heads. These heads control the water flow. They slow and limit the output. Water is allowed to build behind it, so the pressure does not feel low while using two shower heads. ​In this guide, a dual shower head is referring to two shower heads connected at the same pipe connector. This can mean a head plus handheld combo like the ​Ana Bath Shower Head combo which allows you to use one or both at the same time. All the dual shower heads have a built-in valve that lets you control whether you just use one shower head at the time or turn both on as needed. ​Always begin by turning off the water. ​Remove your current shower head by turning it on the head and holding the arm with pliers and a wrench. Once the old shower head is off, remove any leftover plumber’s tape so the arm threads are clean and ready for your new shower head. Clean any rust that might have developed on the pipe. ​First, install the base valve. This is a small rectangle piece that will connect to both the main head and removable shower head. It is also where the switching valve is located. ​Make sure you wrap the ​shower arm’s​ connecting threads in new plumbing tape to seal it from leaks. ​Next, wrap the valve’s threads in plumber’s tape and add on the main shower head. Make sure you are tightening it on by using pliers and a cloth as a scratch resistant barrier. Make sure everything's clean before proceeding. Finally, connect the second mobile shower head by screwing in the extending rope pipe and then securing the wand shower head onto it. Make sure you are wrapping a good amount of plumber’s tape on each of the connecting threads you encounter. ​If leaks occur, remove the troubling area, wrap on more plumber’s tape, and re-tighten it down. ​This sounds similar to installing a dual shower head, but its actually different. When you install two shower heads, you end up having multiple "units". ​This gives you the ability to select the best shower unit for rain effect to mount above you, and a second mobile wand shower head ​to use as a handheld option. You won’t need to cut into the ceiling or spend more money for a plumber to come out and install it for you. To really enhance your rainfall shower head, purchase and install a longer shower arm​. This will give you a closer-to-the-center rainfall shower head experience without having to run pipes up to the ceiling. You will also want to install a shower wand holder onto your shower wall so the shower wand has a docking place that does not interfere with the rainfall shower. While the thought of drilling into your tile may seem too big of a task, it is really simple with the right tools. It also gives you a better hold than a suction cup holder will. Use a stud finder to locate and mark the stud outline with a pencil on your tile. ​Use a tile and glass drill bit and set your drill to a slow speed. Going slower will help you not to crack the tile. Line up and mark with a pencil the spot that you want to place the screw or screws in the holder. Use the drill bit to make the screw holes into the wall, going deep enough to fully penetrate the tile and just barely hitting the wood stud behind it. Clean up the bathroom with a tile mop for any debris that fell to the floor from drilling. Make sure to use certified cleaners for the bathroom, or a natural one you can make from scratch. Now, place your holder and insert the screws into the pre-drilled holes. Tighten and slide up any decorative plates that will cover the screws. If you want a less invasive holder, you can find good suction cup holders like the ​Instant Mount Hand-Held Shower Bracket by RainSpa. The suction cup versions should last for a few months before showing signs of decline like slipping or coming off. Re-wet the back and reapply the suction cup to the center of a tile. Make sure it is not too close to the edge. The tile will concave in around the grout seams, making the suction strength less effective. ​Figuring out how to plumb a shower with multiple heads and valves is a more involved DIY project, but it can be done without a professional. Due to the behind the wall invasive steps, you will want to at least consult a professional at your local home store before you make the final decision. The steps include adding a second water line, rerouting pipes, and fitting a new male pipe for the second shower head to come out of. If you are trying to add it to an already finished shower, it can be a more complicated task. ​This would be better done to a new shower that has not been completed or a gutted shower that is being redone. Now that you know how to add a second shower head you can update your shower to better accommodate two.